Event is organized by the Parks Chamber of Commerce. 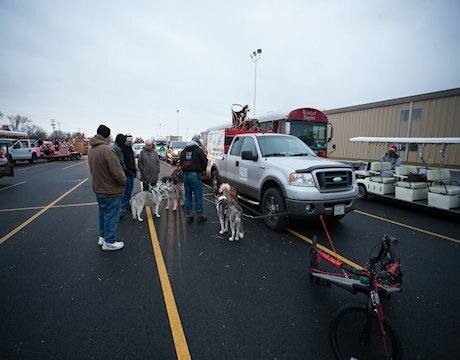 We will have the sled team in the parade along with volunteers / past adopters who decorate themselves or their dog in lights and Christmas stuff and join us in the parade. Lineup for those participating will be at 3:30pm at the Schneider Electric (Invensys /Barber Colman) parking lot at 1354 Clifford Ave., Loves Park. The parade begins at 4:45 pm traveling north on Elm Ave., turning left onto Roosevelt Rd, and ending at the old Machesney Park mall. If you are a Free Spirit volunteer or past Free Spirit adopter and interested in participating with our entry, email us at fssleddemoteam@gmail.com. We will have a vehicle with a trailer if anyone or their dog gets tired.